McIntosh launches MA7200 and MAC7200 amplifiers | What Hi-Fi? The MA7200 integrated amplifier features a wealth of inputs and an upgradeable DAC, while the MAC7200 receiver adds AM/FM radio. McIntosh is covering all bases by furnishing its new 200 watts-per-channel MA7200 integrated amplifier with 14 inputs. Eight of these are analogue connections: five unbalanced, one balanced, plus MC and MM phono inputs for turntables. The remaining six are digital, and include a pair of coaxial and optical inputs, a proprietary MCT input for use with McIntosh SACD/CD transports and, finally, a USB input. The latter supports PCM files up to 32-bit/384kHz, DSD256 and DXD 384kHz. The digital inputs are housed in McIntosh’s DA1 Digital Audio Module, which features a 32-bit DAC used in Quad Balanced mode. In fact, spec-wise, the MA7200 isn't far off McIntosh's most powerful integrated amplifier ever. Doing its best to futureproof the MA7200, McIntosh has also made the DAC module upgradeable, so it can be replaced should that be desirable. 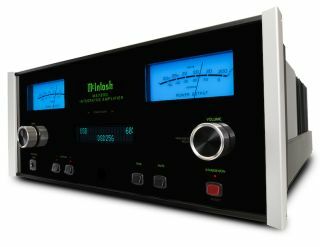 McIntosh says the MA7200 features many design improvements over the last generation of McIntosh integrated amplifiers. Upgrades include more powerful control microprocessors, some of the latest audio-grade circuit components and the addition of McIntosh’s latest Headphone Crossfeed Director (HXD) technology. The unit also features McIntosh’s new Monogrammed Heatsinks, bass and treble tone controls, gold-plated speaker binding posts and a High Drive headphone amplifier which feeds the amp's 6.3mm headphone output. Loyal to McIntosh’s unmistakable trademark design, it packages that all up behind blue VU meters, a black glass front panel with aluminum end caps, and an illuminated logo. The MAC7200 receiver, meanwhile, builds on the MA7200 integrated amplifier by adding an integrated AM/FM tuner to proceedings. It features dedicated buttons for presets (there are 20 for each radio band) and tuning, and the FM tuner supports Radio Data System (RDS), allowing radio station information to be displayed. Both components will arrive on UK soil in October, with the MA7200 priced at £9,500. The damage of the MAC7200, however, is yet to be confirmed.